Keep job sites organized and clean. Resealable bag keeps materials dry, clean and uncontaminated. Tight on space? Rooftop garden? Not a problem. With a 1m x 1m footprint, the Less Mess™ bag neatly fits any space. Earth. Stone. Sand. Mulch. Compost. Any material you need for your project can be delivered in the Less Mess™ bag. Cut labour costs by keeping bags right where you need them. 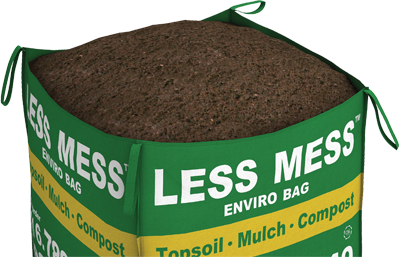 Reuse Less Mess™ bags for waste disposal to save money or where bins aren’t an option.